Biaxially oriented polyester films formed from a crystallizable polyester having increased diethylene glycol content and/or increased polyethylene glycol content, and/or increased isophthalic acid content, preferably polyethylene terephthalate. The films of the invention further include at least one IR-reflective pigment and one UV stabilizer. The inventive films feature adjustable mattness, diffuse scattering power for visible light, high light transmittance and IR reflectance and good thermoformability, and are suitable for thermally protective coatings or thermally protective packaging. This application claims prriority to German parent application 10 2004 032 595.2 which is hereby incorporated by reference in its entirety. The invention relates to a matt, IR-reflective biaxially oriented polyester film whose thickness is in the range from 3 to 200 μm. The film comprises at least one lamellar, IR-reflective pigment and one UV stabilizer, and features good orientability, adjustable mattness, diffuse scattering power for visible light, high light transmittance, very good longitudinal and transverse mechanical properties, good thermoformability, very little yellowing after a prolonged period of insolation, and cost-effective production. The invention further relates to a process for the production of this film and to its use. Biaxially oriented polyester films in the range of thickness from 3 to 200 μm are well known in the form of transparent, matt, and white films. These films are produced with pigments, e.g. silicon dioxide, calcium carbonate, barium sulfate, kaolin, titanium dioxide, aluminum oxide, or combinations thereof. These films are generally not thermoformable, do not exhibit diffuse scattering power for visible light, and certainly do not reflect IR radiation. EP 0 659 198 B1 describes composite materials intended for solar radiation purposes, screening purposes, and, respectively, filtering purposes, uses described being agriculture and horticulture. These films are comprised of a transparent polymer selected from the group of low- or high-density polyethylene, ethylene-vinyl acetate copolymer, polytetrafluoroethylene, polyvinylidene dichloride, polyvinyl chloride, polycarbonate, polymethyl methacrylate, and mixtures thereof. These films comprise from 0.1 to 30% by weight, based on the polymer of an interference pigment which is comprised of a lamellar material, which has been coated with one or more metal oxides. This film features selective screening of radiation, which has a favorable effect on plant growth. EP 0 791 620 A2 describes films for agricultural applications comprised of polyetheramide block copolymers, of thermoplastic polyester elastomers, or of thermoplastic polyurethanes, having water-vapor permeability of from 100 to 25 000 g/m2/24 h, transmittance of from 20 to 90% for visible light, and transmittance of from 5 to 90% for thermal radiation with wavelength of 5 μm. The films comprise lamellar inorganic particles which have been coated with a substance with a high refractive index. The films described have not been biaxially oriented and therefore have inadequate longitudinal and transverse mechanical properties, making them unusable for many applications where the demands are high ultimate tensile strength, high modulus of elasticity, high tensile strain at break values, and high tensile stress values to generate 5% tensile strain (F5 value). The films described are moreover unsuitable for the thermoforming process, because the result would be uncontrolled orientation of the pigments partially orientated via melt flow. This would have an uncontrolled effect on optical properties of the film, e.g. gloss, haze, and mattness, via vacuole formation involving pigments and orientation of the film. These films moreover yellow as a result of prolonged insolation, making them unsightly. The mechanical properties of the films are also impaired by insolation, and the films therefore become brittle after a very short time. This effect, brought about by the short-wave fraction of sunlight, is very much more pronounced in pigmented films, in particular in films which comprise photoactive metal oxides, e.g. titanium dioxide, than in unpigmented films. EP 1 251 369 A2 describes biaxially oriented multilayer polyester films whose base layer comprises an IR-absorbent dye, and which are suitable for use as IR filters. This dye has an absorption maximum at from 800 to 1000 nm, and gives the film maximum transmittance of 30% at 950 nm. The use of standard polyesters combined with biaxial orientation of the films described makes them completely unsuitable for thermoforming processes. The films described are moreover unsuitable for outdoor applications because prolonged insolation impairs their mechanical and optical properties. Because the IR-absorbing dyes used are sensitive organic molecules which are decomprised by insolation, the IR-filter action of the films described rapidly reduces in outdoor applications. It was therefore an object of the present invention to provide a matt, IR-reflective, thermoformable, polymer film which does not have the disadvantages known from the prior art for various types of film. A further intention is that this film should not only be cost-effective to produce and have good longitudinal and transverse orientability, but should also have adjustable mattness, good thermoformability, and, primarily, very good mechanical properties, i.e. high longitudinal and transverse ultimate tensile strength, high longitudinal and transverse modulus of elasticity, high longitudinal and transverse tensile strain at break, and high longitudinal and transverse tensile stress to generate tensile strain of 5% (F5 value), and in particular should have high light transmittance, diffuse scattering power for visible light, very low permeability to IR radiation, and very little change in yellowness index after prolonged insolation. This object is achieved via a biaxially oriented polyester film which comprises as main constituent crystallizable polyester whose DEG content is preferably greater than or equal to 1% by weight and/or whose IPA content is preferably greater than or equal to 2% by weight, and/or whose PEG content is preferably greater than or equal to 1% by weight. This film is characterized by comprising at least one IR-reflective, preferably lamellar, pigment, and by comprising at least one UV stabilizer. Pigment and UV stabilizer are preferably added by means of masterbatch technology during film production. The thickness of the inventive film is preferably from 3 to 200 μm, in particular from 10 to 150 μm. DEG is diethylene glycol, PEG is polyethylene glycol, and IPA is isophthalic acid. The film may comprise one or more crystallizable polyesters as a main constituent. Good orientability includes the capability of the film to give excellent longitudinal and transverse orientation during its production, without break-offs. Cost-effective production includes the capability of the raw materials or raw material components needed for producing the film to be dried using commercial industrial dryers of the prior art. It is important that the raw materials here do not cake and do not undergo thermal degradation. Among these prior-art industrial dryers are vacuum dryers, fluidized-bed dryers, and fixed-bed dryers (tower dryers). Thermoformability means that the film can be thermoformed on commercially available thermoforming machines without uneconomic predrying to give complex and large-surface-area moldings. Adjustable mattness means that the gloss of the film, and also its roughness, can be adjusted during the film production process either by way of the dimensions of the pigment (longitudinal dimension:transverse dimension) or else by way of the processing and orientation parameters. Mattness also means that the inventive film has vacuoles whose length is in the range from 0.5 to 20 μm. Among the good mechanical properties are a high modulus of elasticity (greater than 3200 N/mm2 longitudinally=in machine direction (MD), greater than 3500 N/mm2 transversely (TD)), high ultimate tensile strength values (more than 100 N/mm2 in MD; more than 130 N/mm2 in TD), high tensile strain at break values (more than 100% in MD and TD), and high tensile stress values to generate 5% tensile strain (F5 value; more than 100 N/mm2 in MD and TD). High light transmittance means that the light transmittance is greater than (>) 60%. Diffuse scattering behavior means that image sharpness is smaller than (<) 85%. Very low permeability to IR radiation means that transmittance for electromagnetic radiation in the wavelength range from 750 to 1300 nm is smaller than 50%. Very little yellowing means that the change in yellowness index (ΔYID) of the film after 5000 h of weathering in a Weather-Ometer is smaller than (<) 6. These abovementioned values are preferred parameters for the inventive film. The film comprises, as main constituent, a crystallizable polyester. According to the invention, a crystallizable polyester is crystallizable homopolyesters, crystallizable copolyesters, crystallizable blends of various polyesters, crystallizable recycled material, and other variations on crystallizable polyesters. Examples of suitable crystallizable or semicrystalline polyesters are polyethylene terephthalate (PET), polyethylene naphthalate (PEN), polybutylene terephthalate (PBT), polytrimethylene terephthalate (PTT), preference being given to polyethylene terephthalate (PET). It is significant for the invention that DEG content and/or PEG content and/or IPA content of the crystallizable polyester is higher than that of standard polyesters. The crystallizable polyester preferably has a DEG content of from 1.0 to 10% by weight, preferably from 1.2 to 5.0% by weight, and in particular from 1.3 to 3.0% by weight, and/or a PEG content of from 1.0 to 10% by weight, preferably from 1.2 to 5.0% by weight, in particular from 1.3 to 3.0% by weight, and/or an IPA content of from 2.0 to 20% by weight, preferably from 3.0 to 15% by weight, and in particular from 5.0 to 10% by weight. It was more than surprising that a higher DEG content and/or PEG content and/or IPA content in comparison with standard polyester makes the films capable of cost-effective thermoforming on commercially available thermoforming plants, giving excellent reproduction of detail, without any measurable alteration of optical properties, such as gloss and mattness. The standard viscosity SV (DCA) of the polyester is preferably from 600 to 1000, preferably from 700 to 900. Preferred starting materials for production of the inventive film are crystallizable polyesters whose crystallite melting point Tm is from 180 to 365° C. or above, preferably from 180 to 310° C., whose crystallization temperature range Tc is from 75 to 280° C., whose glass transition temperature Tg is from 65 to 130° C. (determined via differential scanning calorimetry (DSC) at density of from 1.10 to 1.45 g/cm3 (determined via DIN 53479). Bulk density (measured to DIN 53466) is generally from 0.75 to 1.0 kg/dm3, preferably from 0.8 to 0.90 kg/dm3. The polydispersity (=Mw:Mn ratio) of the polyester, measured via gel permeation chromatography (GPC) is preferably from 1.5 to 4.0, particularly preferably from 2.0 to 3.5. “Main constituent” means that the proportion of the crystallizable or semicrystallizable polyester(s) is preferably from 50 to 99% by weight, particularly preferably from 75 to 95% by weight, based in each case on the total weight of the film. The remaining content may be made up not only by the lamellar, IR-reflective pigment but also by other pigments or additives conventional for biaxially oriented polyester films. The inventive film is preferably a single-layer film, and may have been coated with various copolyesters or adhesion promoters. The thickness of the inventive film may vary within wide limits, and depends on the intended application. It is preferably from 3 to 200 μm, in particular from 5 to 150 μm, and particularly preferably from 10 to 100 μm. The inventive film can moreover be recycled without polluting the environment, and the film produced here from the recycled material exhibits practically no impairment of optical properties (in particular yellowness index) or of mechanical properties when compared with a film produced from virgin starting materials. The inventive film comprises at least one, preferably lamellar, IR-reflective pigment, and at least one UV stabilizer. It is advantageous for the pigment to be fed by way of masterbatch technology directly during film production, the concentration of the pigment here being from 0.5 to 50% by weight, with preference from 1.0 to 25% by weight, and in particular from 1.5 to 15% by weight, based on the weight of the film. Examples of suitable lamellar, IR-reflective pigments are phyllosilicates, e.g. kaolin, talc, or feldspar which have been coated with metal oxides, e.g. titanium dioxide, zirconium dioxide, aluminum oxide, and/or silicon dioxide. The size of the pigments is preferably from 1 to 100 μm. Pigments of this type are described in EP 0414049 of Merck and Hyplast, particular preference being given here to IRIODIN® SHR 870 and IRIODIN® SHR 875 from Merck, Germany. In principle, all, preferably lamellar, IR-reflective pigments are suitable for the inventive purpose. It is important that these pigments are orientated via the orientation of the film and, as a function of orientation, form vacuoles of varying size. These vacuoles determine the appearance of the film and the diffuse scattering power for visible light. This means that, given identical pigment content in the film, its optical properties and the diffuse scattering power can be adjusted by way of the stretching temperatures and the stretching parameters during film production. It was more than surprising that the production and the formation of vacuoles is not impaired by the high DEG content and/or high PEG content and/or high IPA content of the polyester. Since these vacuoles are optimized via the orientation process and have been stabilized via the heat-setting process, no adverse effect on optical properties occurs during the thermoforming process. Electromagnetic radiation in the wavelength range from 750 to 1300 nm (IR) is in particular responsible for increases in indoor temperatures. This radiation likewise impairs heat-sensitive goods. The film of the invention reflects radiation in this wavelength range, so that the transmittance of the film is preferably smaller than 50% at from 750 to 1300 nm. A consequence is less rise in indoor temperatures and the possibility of packaging heat-sensitive goods, if the inventive film is used appropriately. The inventive film comprises not only the IR-reflective pigment but at least one UV stabilizer. Light, in particular the ultraviolet content of insolation, i.e., the wavelength region from 280 to 400 nm, induces degradation in thermoplastics, as a result of which their appearance changes due to color change or yellowing, and there is also an extremely adverse effect on mechanical/physical properties of the films comprised of the thermoplastics. Inhibition of this photooxidative degradation is of considerable industrial and economic importance, since otherwise there are drastic limitations on the applications of numerous thermoplastics. The absorption of UV light by polyethylene terephthalates, for example, starts only just below 360 nm, increases markedly below 320 nm, and is very pronounced at below 300 nm. Maximum absorption occurs at between 280 and 300 nm. In the presence of oxygen it is mainly chain cleavage which occurs, but there is no crosslinking. The predominant photooxidation products in quantity terms are carbon monoxide, carbon dioxide, and carboxylic acids. Besides direct photolysis of the ester groups, consideration has to be given to oxidation reactions which likewise form carbon dioxide via peroxide radicals. In the photooxidation of polyethylene terephthalates there can also be cleavage of hydrogen at the position a to the ester groups, giving hydroperoxides and decomposition products of these, and this may be accompanied by the chain cleavage (H. Day, D. M. Wiles: J. Appl. Polym. Sci. 16, 1972, p. 203). UV stabilizers, i.e. light stabilizers which are UV absorbers, are chemical compounds which can intervene in the physical and chemical processes of light-induced degradation. Carbon black and other pigments can give some protection from light. However, these substances are unsuitable for pale-colored or indeed opaquely colored films, since they cause discoloration or color change. UV stabilizers suitable as light stabilizers are those which preferably absorb at least 70%, with preference 80%, particularly preferably at least 90%, of the UV light in the wavelength region from 180 to 380 nm, preferably from 280 to 350 nm. These are particularly suitable if they are thermally stable in the temperature range from 260 to 300° C., that is to say they do not decompose to give cleavage products and do not cause evolution of gases. 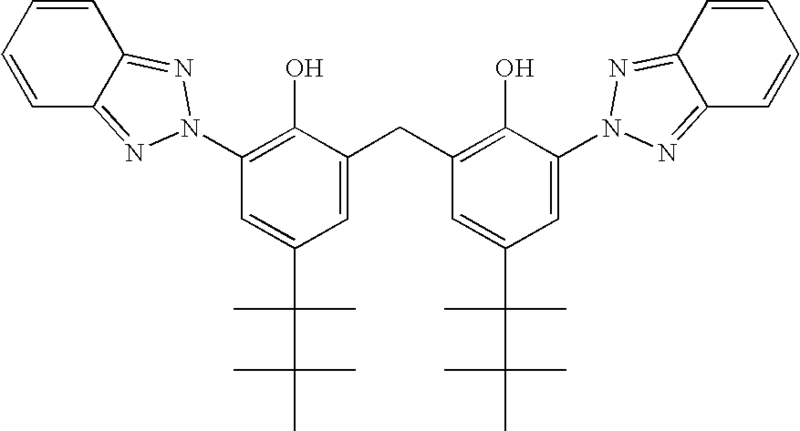 Examples of UV stabilizers suitable as light stabilizers are 2-hydroxybenzophenones, 2-hydroxybenzotriazoles, organonickel compounds, salicylic esters, cinnamic ester derivatives, resorcinol monobenzoates, oxanilides, hydroxybenzoic esters, benzoxazinones, and sterically hindered amines and triazines, and among these preference is given to the 2-hydroxybenzotriazoles, the benzoxazinones, and the triazines. It was surprising that the use of UV stabilizers in combination with the IR-reflective pigments described above gives useful films with excellent properties. The inventive film protects, by way of example, packed goods from short-wavelength light in the wavelength range from 200 to 380 nm, its transmittance preferably being smaller than (<) 50% for radiation in the wavelength range from 750 to 1300 nm, the results being prevention of undesired increase in the temperatures of the packed product and resultant premature spoiling. When used in the construction sector the film moreover provides thermal protection, i.e. reduces the amount of increase in indoor temperatures, without yellowing on exposure to prolonged insolation. The literature discloses UV stabilizers which absorb UV radiation and thus provide protection. However, when these known commercially available UV stabilizers are used it is found that the UV stabilizer has inadequate thermal stability and, at temperatures of from 200 to 240° C., decomposes or causes evolution of gas. It would therefore have been necessary to incorporate large amounts (from about 10 to 15% by weight) of UV stabilizer into the film so that it gives really effective absorption of UV light. However, at these high concentrations the film discolors markedly even before the production process is complete. Mechanical properties, too, are adversely affected. On orientation, exceptional problems occur, e.g. break-offs due to inadequate film strength (low ultimate tensile strength and modulus of elasticity), die deposits leading to profile variations, deposits of UV stabilizer and pigment on the rolls, leading to impairment of optical properties (marked haze, adhesion-related defects, inhomogeneous surface), and deposits in the stretching and setting frame, which contaminate the film. It was therefore surprising that even low concentrations of the preferred UV stabilizers achieve excellent UV protection, and that a film with low yellowness index is obtained. Surprisingly, the presence of the UV stabilizer has absolutely no effect on protection from radiation in the wavelength range from 750 to 1300 nm. These, and other inventive UV stabilizers, are commercially available. In another embodiment, it is also possible to use a mixture of UV stabilizers, or a mixture of these UV stabilizers, or a mixture of at least one of these UV stabilizers with other UV stabilizers. The total concentration of light stabilizer is preferably from 0.1 to 5.0% by weight, particularly preferably from 0.5 to 3.0% by weight, based on the weight of the film. The inventive film may comprise not only the IR-reflective pigment and the UV stabilizer but also other conventional additives, such as fillers and antiblocking agents. They are advantageously added to the polymer or polymer mixture prior to the start of the melting process. Other additives which may be selected are a mixture of two or more different antiblocking agents, or a mixture of antiblocking agents of the same constitution but of different particle size. The conventional proportions of the particles may be added to the film, e.g. in the form of a glycolic dispersion, during the polycondensation process or by way of masterbatches during extrusion. Pigment concentrations of from 0.0001 to 10% by weight, based on the weight of the film, have proven to be particularly suitable. For particular applications it can be advantageous for the surface of the film to be chemically pretreated with an acid. Particularly suitable compounds for this process known as adhesion-promotion by etching are trichloroacetic acid, dichloroacetic acid, or hydro-fluoric acid, which act on the surface for a short period (from 5 to 120 seconds) and then are removed by means of air knives. This gives the film a very reactive, amorphous surface. The inventive film may have at least one further functionality. The additional functionality is preferably that the film has been corona- or flame-treated and/or rendered flame-retardant, and/or coated on one or both sides. In the case of single- or double-sided coating of the film, the thickness of the dried coating is generally from 5 to 100 nm, preferably from 20 to 70 nm, in particular from 30 to 50 nm. It is preferably applied in-line, i.e. during the film-production process, advantageously prior to the transverse orientation process. Particular preference is given to application by means of the reverse gravure-roll coating process, which can apply the coating extremely homogeneously at the layer thickness mentioned. The coatings are applied—preferably in aqueous form—in the form of solutions, suspensions, or dispersions, in order to give the film surface additional functionalities. Examples of substances or compositions which give additional functionality are acrylates (see WO 94/13476), ethylene-vinyl alcohols, polyvinylidene chloride, water glass (sodium silicate), aminosilanes (described in EP 0 359 017 and its United States equivalent U.S. Pat. No. 4,939,035 or EP 0 346 768 and its United States equivalent U.S. Pat. No. 4,898,786), hydrophilic polyesters (PET/IPA polyesters as described in EP-A-144 878 or U.S. Pat. No. 4,252,885, comprising the sodium salt of 5-sulfoisophthalic acid), copolymers having vinyl acetate units (see WO 94/13481), polyvinyl acetates, polyurethanes, the alkali metal or alkaline earth metal salts of (C10–C18) fatty acids, copolymers having units comprised of butadiene and acrylonitrile, methyl methacrylate, methacrylic acid and/or acrylic acid and/or esters thereof. The substances or compositions which give the additional functionality can comprise the usual additives, such as antiblocking agents and/or pH stabilizers, their amounts preferably being from 0.05 to 5% by weight, with preference from 0.1 to 3% by weight. The compositions or substances mentioned are applied in the form of dilute, preferably aqueous solution, emulsion, or dispersion to one or both sides of the film. The solvent is then removed. If the coatings are applied in-line prior to the transverse stretching process, the heat treatment in the stretching frame is usually sufficient to volatilize the solvent and to dry the coating. The layer thicknesses of the dried coatings are then generally from 5 to 100 nm, preferably from 20 to 70 nm, in particular from 30 to 50 nm. In order to establish further desired properties, the film may also have been corona- or flame-treated. The manner of treatment is usually such that the surface tension of the film is then generally above 45 mN/m. In another embodiment, the inventive film has been rendered flame-retardant. Flame-retardant means that in what is known as a fire protection test the film complies with the conditions of DIN 4102 Part 2 and in particular the conditions of DIN 4102 Part 1, and can be allocated to construction materials class B2 and in particular B1 for low-flammability substances. The film, if appropriate rendered flame-retardant, is moreover intended to achieve at least the fire classification VTM-2 in a UL 94 VTM fire test. The film then comprises at least one flame retardant, which is preferably fed by way of masterbatch technology directly during film production, the proportion of this flame retardant generally being in the range from 0.2 to 30% by weight, preferably from 0.5 to 25% by weight, particularly preferably from 1.0 to 20% by weight, based on the weight of the film. The proportion of the flame retardant in the masterbatch is generally from 5 to 60% by weight, preferably from 10 to 50% by weight, based in each case on the total weight of the masterbatch. Examples of suitable flame retardants are organic bromine compounds, organic chlorine compounds, or organic nitrogen compounds, or metal hydroxides or metal oxide trihydrates. However, a disadvantage of the halogen compounds is that in the event of a fire toxic and corrosive hydrogen halides can be produced. Another disadvantage is the low light resistance of a film modified therewith. It is significant that the flame retardant is soluble in the polymer or polyester, because otherwise compliance with the optical properties required is not achieved. Examples of other suitable flame retardants are organophosphorus compounds, such as carboxyphosphinic acids, their anhydrides, and dimethyl methanephosphonate. Very suitable flame retardants here are those in which the phosphorus compound has chemical bonding to the polyester. is preferred as flame retardant. Because the flame retardants generally have some degree of sensitivity to hydrolysis, additional use of a hydrolysis stabilizer can be advisable. Examples of suitable hydrolysis stabilizers here are polymeric carbodiimides. In this preferred embodiment, the inventive low-flammability film comprises, as main constituent, crystallizable polyester or PET, from 1 to 20% by weight of an organophosphorus compound as flame retardant soluble in the polyester, and preferably from 0.1 to 1.0% by weight of a hydrolysis stabilizer, based on the weight of the film. The proportions described of flame retardant, and hydrolysis stabilizer have also proven advantageous when the main constituent of the film is not polyethylene terephthalate, but another polyester. Measurements also showed that the inventive film does not become brittle when exposed to temperatures of 100° C. over a prolonged period. The inventive film can moreover be thermoformed without predrying, and can therefore be used to produce complex moldings. The thermoforming process generally encompasses the steps of predrying, heating, molding, cooling, demolding, and heat-conditioning. A surprising finding in the thermoforming process was that the inventive films can be thermoformed without predrying. This advantage over thermoformable polycarbonate films or thermoformable polymethacrylate films, for which the required predrying times, depending on thickness, are from 10 to 15 hours at temperatures of from 100 to 120° C., dramatically reduces the costs for the forming process. Mold temperature from 100 to 160° C.
Film temperature from 160 to 200° C.
Surprisingly, optical properties, particularly mattness, haze, and transparency of the film, were found to remain homogeneous and unchanged during thermoforming with an orientation factor of 2.0. This is probably attributable to the fact that the lamellar, IR-reflective pigment particles have very substantial orientation parallel to the film surface via the high level of longitudinal and transverse stretching and subsequent heat-setting in the film-production process. The present invention also provides a process for producing the inventive film. The production process usually involves an extrusion process, for example on an extrusion line. It has proven particularly advantageous to add the IR-reflective pigment, the UV stabilizer, and, if appropriate, the other additives in the form of predried or precrystallized masterbatches prior to the extrusion process. In masterbatch technology it is preferable that the grain size and the bulk density of the masterbatches are similar to the grain size and the bulk density of the polyester used, thus achieving homogeneous dispersion, which gives homogeneous properties. The inventive polyester films may be produced in the form of a single-layer film (monofilm) by known processes from a polyester and, if appropriate, from other polymers, and from at least one preferably lamellar, IR-reflective pigment and one UV stabilizer, and, if appropriate, from other conventional additives (the latter in the usual amount of from 0.1 to 30% by weight, based on the weight of the film). One or both surfaces of the film may moreover be provided with a functional coating by known processes. Masterbatches which comprise the IR-reflective pigments should preferably have been precrystallized or predried. The same applies to masterbatches which comprise UV stabilizers, comprise flame retardants, and/or comprise other additives. This predrying involves gradual heating of the masterbatches at reduced pressure (from 20 to 80 mbar, preferably from 30 to 60 mbar, in particular from 40 to 50 mbar), stirring, and, if appropriate, after-drying at a constant, elevated temperature (likewise at reduced pressure). The masterbatches are preferably charged batchwise at room temperature from a feed vessel in the desired blend together with the polyester and, if appropriate, with other polymer components into a vacuum dryer which during the course of the drying time or residence time traverses a temperature profile of from about 10 to 160° C., preferably from 20 to 150° C., in particular from 30 to 130° C. During the residence time of about 6 hours, preferably 5 hours, in particular 4 hours, the mixture of raw material is stirred at from about 10 to 70 rpm, preferably from 15 to 65 rpm, in particular from 20 to 60 rpm. The resultant precrystallized or predried raw material mixture is after-dried in a downstream, likewise evacuated, container at from about 90 to 180° C., preferably from 100 to 170° C., in particular from 110 to 160° C., for from 2 to 8 hours, preferably from 3 to 7 hours, in particular from 4 to 6 hours. In the preferred extrusion process for production of the film, the molten polymer material is extruded with the other ingredients through a flat-film die, and quenched on a chill roll in the form of a substantially amorphous prefilm. This film is then reheated and oriented longitudinally and transversely, or transversely and longitudinally, or longitudinally, transversely, and again longitudinally and/or transversely. The stretching temperatures are generally above the glass transition temperature Tg of the film by from 10 to 60° C., the longitudinal stretching ratio is usually from 2.0 to 6.0, in particular from 3.0 to 4.5, the transverse stretching ratio being from 2.0 to 5.0, in particular from 3.0 to 4.5, and the ratio for any second longitudinal and transverse stretching carried out being from about 1.1 to 5.0. The first longitudinal stretching may also be carried out simultaneously with the transverse stretching (simultaneous stretching). Heat-setting of the film follows at oven temperatures of from 180 to 260° C., in particular from 220 to 250° C. The film is then cooled and wound. It was surprising that in particular the use of the additives or ingredients described and of masterbatch technology, combined with a suitable predrying and/or precrystallization process can produce an IR-reflective film with the required property profile without technical problems (such as caking in the dryer). During the production process, no, or almost no, deposits on the dies or condensation on the frames was observed, the result being that the inventive film has excellent optical properties, an excellent profile, and excellent layflat. It gives excellent results when oriented and can therefore be produced cost-effectively in a reliable process. It was surprising that the film has not only excellent thermoformability without any effect on optical properties but also exhibited a very small change, smaller than (<) 6, in yellowness index after 5000 hours of Weather-Ometer weathering (WOM weathering), and that the IR-reflective effect, the high light transmittance, and the scattering power for visible light remain substantially unaffected. Even after this very aggressive artificial weathering, transmittance for radiation in the wavelength range from 750 to 1300 nm (IR) is smaller than 50%. Another very surprising fact is that the regrind can also be reused during film production without any adverse effect on the yellowness index of the film. There is also no adverse change in the yellowness index within the limits of measurement precision when comparison is made with an untreated film. The combination of their properties makes the inventive films suitable for a wide variety of applications, for example in the indoor and outdoor sector, in the construction sector and in the construction of exhibition stands, in the fitting-out of shops and of stores, in the electronics sector, and in the lighting sector, for greenhouses, exhibition requisites and promotional requisites, illuminated advertising profiles, protective glazing for machines and for vehicles, displays and placards, and for packaging, in particular of heat-sensitive goods, with no restriction thereto. Inventive examples are used below for further illustration of the invention, which is not restricted thereto. Light transmittance is the ratio of total transmitted light to the amount of incident light. Light transmittance is measured using ®HAZEGARD plus (Byk Gardener, Germany) test equipment to ASTM D1003. Haze is the percentage proportion of transmitted light that deviates by more than 2.5° from the average direction of the incident light beam. Clarity is determined at an angle of less than 2.5°. Haze and clarity are measured using ®HAZEGARD plus (Byk Gardener, Germany) test equipment to ASTM D1003. Surface defects were determined visually. Modulus of elasticity, ultimate tensile strength, tensile strain at break, and F5 value are measured longitudinally and transversely to ISO 527-1-2 with the aid of tensile test equipment (Zwick, 010, Ulm, Germany). The films from inventive examples 1 to 5 and comparative examples 1 and 2 can be thermoformed without predrying to give moldings on commercially available thermoforming machines, e.g. from Adolf Illig Maschinenbau (Heilbronn, Germany). Reproduction of detail in the moldings is excellent, with a homogeneous surface. Fire performance was determined to DIN 4102 Part 2, construction materials class B2, and to DIN 4102 Part 1, construction materials class B1, and also in the UL 94 VTM test. Gloss was determined to DIN 67530. The reflectance was measured, this being an optical value characteristic of the film surface. Based on the standards ASTM D523 and ISO 2813, the angle of incidence was set at 20° and 60°. A beam of light hits the flat test surface at the set angle of incidence and is reflected and/or scattered by this surface. A proportional electrical variable is displayed representing light rays hitting the detector. The value measured is dimensionless and must be stated together with the angle of incidence. Roughness Ra of the film was determined to DIN 4768 with a cut-off of 0.25 nm. The IR permeability of the film is determined on the basis of an IR transmittance spectrum. An FTIR 1600 from Perkin Elmer, US was used. The wavelength range measured extends from 750 to 1300 nm. The IR permeability measured in % is the ratio of the amount of light transmitted to the amount of light incident in this wavelength range. Diethylene glycol content, polyethylene glycol content, and isophthalic acid content is determined by gas chromatography after alkaline digestion of the specimen. The length of vacuoles in the film was determined on the basis of scanning electron micrographs of microtom sections. Each of the Examples and Comparative Examples below uses a single-layer film, produced on the extrusion line described. The films were weathered to test specification ISO 4892 on both sides, in each case for 5000 hours, using the Atlas Ci 65 Weather-Ometer, and then tested for discoloration. Masterbatch MB1 was comprised of 10% by weight of the lamellar IR-reflective pigment IRIODIN® SHR 870 (Merck, Germany) and 90% by weight of polyethylene terephthalate (RT49, KoSa, Germany). The bulk density of the masterbatch was 750 kg/m3. 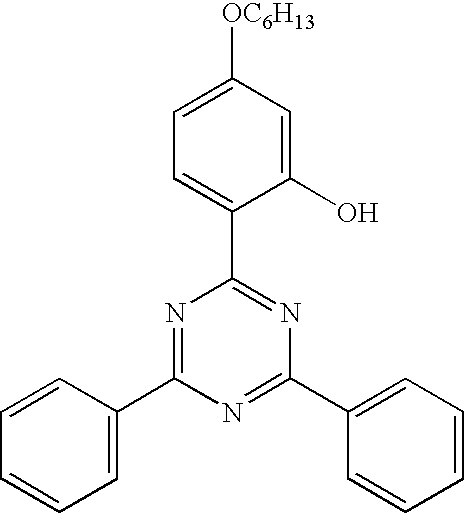 Masterbatch MB2 was comprised of 20% by weight of 2-(4,6-diphenyl-1,3,5-triazin-2-yl)-5-hexyloxyphenol (TINUVIN® 1577 from Ciba Specialty Chemicals, Switzerland) and 80% by weight of polyethylene terephthalate (RT49, KoSa, Germany). The bulk density of the masterbatch was 750 kg/m3. The following masterbatch was used to produce a flame-retardant film: Masterbatch MB3, a copolyester comprised of terephthalic acid, ethylene glycol, and 30% by weight of bis(2-hydroxyethyl) [(6-oxido-6H-dibenzo[c,e][1,2]-oxaphosphorin-6-yl)methyl]butanedicarboxylate as further diol component (VA09, KoSa, Germany). A monofilm was produced and comprised polyethylene terephthalate as a main constituent, 20% by weight of MB1, and 5% by weight of MB2. The standard viscosity SV (DCA) of the polyethylene terephthalate was 810, corresponding to intrinsic viscosity IV (DCA) of 0.658 dl/g, its diethylene glycol content being 2.5%, and its isophthalic acid content being 8.0%. A mixture comprised of 75% by weight of polyethylene terephthalate, 20% by weight of masterbatch MB1 and 5% by weight of MB2 was charged at room temperature from separate feed vessels into a vacuum dryer which traversed a temperature profile of from 25 to 130° C. from the charging time to the end of the residence time. During the residence time of about 4 hours, the raw material mixture was stirred at 61 rpm. The precrystallized or predried raw material mixture was after-dried in the downstream hopper, likewise in vacuo, for 4 hours at 140° C. The extrusion process described was then used to produce a single-layer film of thickness 75 μm. The longitudinal and transverse stretching ratio set during film production was λL=λQ=3.1. The stretching temperature during longitudinal and transverse orientation was TL=TQ=110° C. The temperature for the subsequent heat-setting was TS=230° C.
By analogy with Example 1, a film of thickness 75 μm was produced. Modifying Example 1, the film comprised 45% by weight of polyethylene terephthalate, 20% by weight of MB1, and 5% by weight of MB2, and also 30% by weight of recycled material directly associated with the process. By analogy with Example 1, a film of thickness 75 μm was produced. Modifying Example 1, the film comprised 55% by weight of polyethylene terephthalate, 20% by weight of MB1, and 5% by weight of MB2, and also 20% by weight of MB3. Example 1 was repeated. Modifying Example 1, the process parameters were as follows: λL=λT=3.5; TL=TT=110° C.; TS=230° C.
Example 1 was repeated. Modifying Example 1, the process parameters were as follows: λL=λT=3.1; TL=TT=95° C.; TS=230° C.
Example 1 was repeated. Modifying Example 1, the film comprises no MB2. Proportion of PET correspondingly increased. Example 1 was repeated. Modifying Example 1, the film comprises no MB1. Proportion of PET correspondingly increased. Example 1 was repeated. Modifying Example 1, however, while the standard viscosity SV(DCA) of the polyethylene terephthalate used is 810 its diethylene glycol content is 0.6% and its isophthalic content is 0%. (RT49 from KoSa, Germany). Example 3 of WO 94/05727 was repeated. The results obtained are shown in the table. wherein said film exhibits diffuse scattering behavior. 2. The polyester film as claimed in claim 1, wherein the crystallizable polyester is polyethylene terephthalate, polyethylene naphthalate, polybutylene terephthalate or polytrimethylene terephthalate. 3. The polyester film as claimed in claim 1, wherein the crystallizable polyester has a diethylene glycol content of from about 1 to 10% by weight and/or an isophthalic acid content of from about 2 to 20% by weight and/or a polyethylene glycol content of from about 1 to 10% by weight. 4. The polyester film as claimed in claim 1, wherein the proportion of crystallizable polyester is from about 50 to 99% by weight based on the weight of the film. 5. The polyester film as claimed in claim 1, wherein the IR-reflective pigment is platelet-shaped. 6. The polyester film as claimed in claim 1, wherein the IR-reflective pigment is sheet silicate coated with metal oxides. 7. The polyester film as claimed in claim 1, wherein the film contains between 0.5 and 50% by weight of the IR-reflective pigment, based on the weight of the film. 8. The polyester film as claimed in claim 1, wherein the film has a transmission of less than about 50% for radiation in the wavelength range between 750 and 1300 nm. 9. The polyester film as claimed in claim 1, wherein the UV stabilizer is a 2-hydroxybenzotriazole, a benzoxazinone or a triazine. 10. The polyester film as claimed in claim 1, wherein the film comprises the UV stabilizer in an amount of from about 0.1 to 5% by weight based on the weight of the film. 11. The polyester film as claimed in claim 1, which comprises a flame retardant. 12. The polyester film as claimed in claim 1, which has one layer. 13. The polyester film as claimed in claim 1, wherein the film is coated functionally on one or both surfaces. c. thermosetting the stretched film. 15. A process for adjusting the mattness of the polyester film as claimed in claim 1, which comprises varying the longitudinal and/or transverse stretching ratio, the stretching temperatures and/or the temperature of the thermosetting without changing the composition of the film. 16. A thermally protective coating or packaging comprising a polyester film as claimed claim 1. H. Day, D. M. Wiles Journal Applied Polymer Science vol. 16, p. 203 (1972).